Die Hard is one of my all-time favorite action movies, and it’s a shame that there wasn’t a decent tie-in game released here in the US. When I saw that there was such a game released for the PC Engine in Japan, I was pretty excited to check it out. Die hard is a top-down shooter, not unlike Ikari Warriors, Commando, or Bloody Wolf. Not a bad style for a Die Hard game, if properly executed. The problem with Die Hard is that it has seemingly nothing to do with the movie. I think back in the day a lot of us put up with bad tie-in games because we felt like we were playing a video game version of the film, but that’s not the case here. As you progress through the game, you fight your way up successive floors of a high rise until the final stage on the roof, and in that sense it is Die Hard-esque, but the similarities end there. The first stage takes place outdoors in a forest-like setting, and the second stage seems to take place in a swamp. Even when you do finally make it into the building, it hardly feels like the high-rising Nakatomi Plaza. 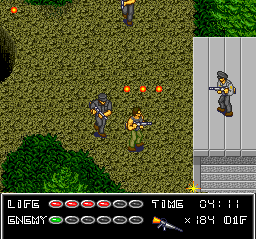 The game features several weapons, including a semi-automatic rifle, submachine gun, grenade launcher, spread gun, etc. Noticably lacking however is the handgun used by John McLane through much of the movie. Die hard has decent graphics that, like much of the console’s library, fall somewhere between the average 8 and 16-bit game, but the environments are repetitive and uninteresting. When coupled with gameplay that’s equally repetitive and uninteresting, the end result is a game that clearly falls into the ‘below average’ category. Buy Die Hard on GameGavel or Amazon. Tagged Action, Die Hard, HuCard, Movie, Pack-In Video, PC Engine, Review, turbografx, turbografx-16. Bookmark the permalink.